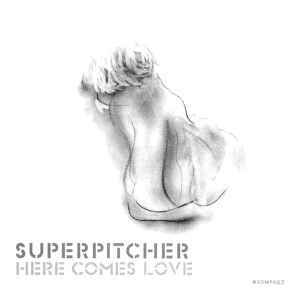 Superpitcher has long since been a Kompakt mainstay, almost becoming synonymous with the label. And while he’s since moved on to his own label, his debut, HERE COMES LOVE, has all the hallmarks of the classic Kompakt sound: a solid 4/4, a melodic overpinning, some strained if heartfelt lyrics, and you have the opener “People.” The schaffel rhythm comes in with “The Long Way” while “Sad Boys” takes a slower approach, tongue firmly in cheek. But if you want sadness, the string-laden “Traume” has you covered. Or if you want a stripped down romance, “Love Me Forever” will do you right. But the electro on his version of “Fever” has enough filth in its synth to give you a dirty feeling. “Lovers Rock” returns us to the dancefloor, but it’s “Happiness” that finally takes our breath away. The long “Even Angels” closes the album on a gentler note, humming on a heavenly loops for its final six minutes. Here comes Superpitcher! This creation sounds like a classical painting, a timeless novel, deeply rooted poetry and romance. The result is just one of the most fantastic "electronic" release I have ever heard. I think you have to be quite a romantic person (or tu put yourself in a romantic mood) to deeply and fully understand this album, because it is the essence of all the tracks. Aksel creates something particulary forward-thinking here because he gives life to very old subjects (love, melancholia, loneliness, angels, etc) but with a glib, passionate and audacious attitude. The minimalistic, shy and repetitiv way to use his voice and words adds something haunting and hypnotising to this tale. The lyrics, sometimes, are gently subversiv. Aksel talks about ideas that are actually not corporate at the moment, like : Loneliness ("We don't need no people to be alone, we are together, on our own.") or Exclusivity ("I came the long way, I came the sad way, just to find you."). While it's socially very cool at the moment to be very activ, to move, to travel, etc, in "Sad Boys" the statement is "we are static melancholic boys and we just don't care.. yep!" Definitely an anti-hedonistic thing, where an ill romance is, paradoxically, refreshing. Special respect to the last track "Even Angels", which is perfection incarnated, and the ultimate synthesis of Superpitcher. Here Comes Love, now and forever.